PM, Defense Minister reportedly give go-ahead to launch heavy retaliation for 300 rockets fired at Israel. Security Cabinet to meet. 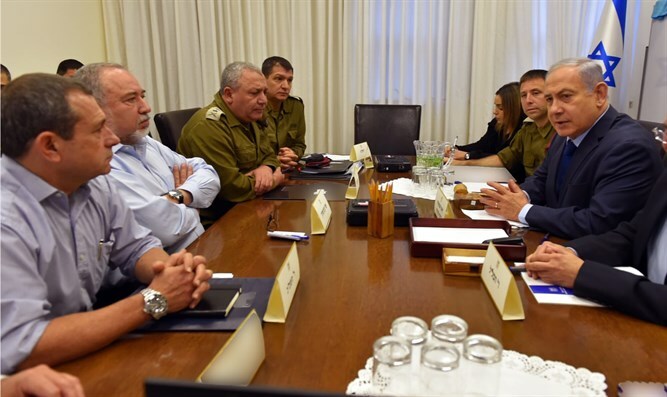 The consultation between Prime Minister Binyamin Netanyahu, Defense Minister Avigdor Liberman, and the military leaders in response to the launching of over 300 rockets from the Hamas-controlled Gaza Strip. lasted over four hours. A political source said that "in the prime minister's consultation with the heads of the defense establishment, operational decisions were made." The IDF has struck about 70 targets in Gaza in response to the continuing rocket attacks. IDF Spokesperson Brigadier General Ronen Manelis warned: "Hamas is leading the Gaza Strip to destruction and will feel the intensity of the IDF's response in the coming hours. So far we have attacked a wide range of targets. Firing squads, military compounds, and observation posts. The attempt to harm civilians is unacceptable to us and we will continue to respond with force."